Can you imagine leaning into the curve of the crescent moon with the side of your body? Picture this celestial move with your creative mind. Allow your weight and the downward flowing energy of your legs and feet sense the root for this pose. Once your awareness finds this root, feel where you lift up and out of it. Visualize the crescent moon taking shape within your mirroring body. Energies sychronize. Your side body releases into the inner arc of the moon, while established roots hold your ground. while arms lengthen in opposite directions. Hands stay relaxed and enlightened. Sense the center of your being, as it is gently stretched and strengthened. The lower body continues to ground while the upper body ascends from stability. 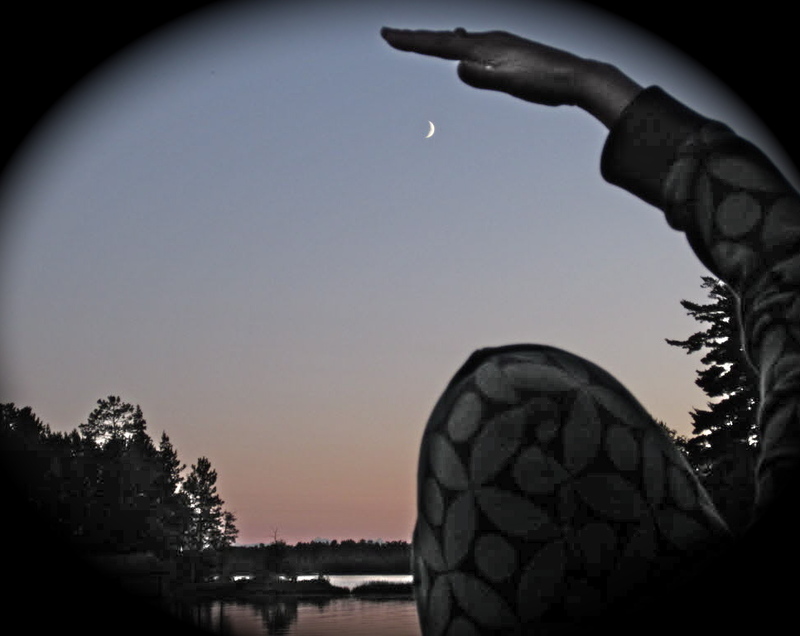 Salute both the waxing & waning cresent moon by switching sides; Re-establish the root of the pose each time. Practice twice on each side, feeling the subtle sensations and changes. Stargazer, yes!! What a great next pose (not usually considered a repose, since it is a dynamic pose, not a resting one). For those a little blurry on the stargazer: Find your 1st warrior stance, but do not bend at the knee. Your heart lifts towards the stars, shoulders rolled back and down, lively arms reaching towards the Earth with palms turned forward and open. Thanks Freddie! !